What happens at a bus stop throughout the day? In this special edition of What’s the Flux: Commuter dispatches, lead Producer, Mona Yeh and Producer, Yuko Kodama sent reporters out to visit some of our region’s busiest bus stops over a 24 hour period. 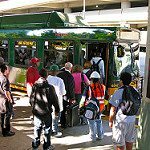 You’ll listen to the rhythm at popular transit centers in our region, and what riders say about their commutes. What’s the Flux: Commuter Dispatches and KBCS partnered with the Seattle Globalist to examine the ridership at bus stops in our region with an interactive map. Reporters: Karl Benitez, Mimansa Dogra, Kendra Hanna, David Joseph, Varisha Kahn, Yuko Kodama, Casey Martin, Hassan Noor, Jenny Phan, Trevor Pogue, Brie Ripley, Chetanya Robinson, and Randy Salgado.